Americans often attribute characteristics of symmetry, balance, and peace with Asian-inspired art and architecture. The philosophical and design concept of feng shui emphasizes the need to have harmony between people and their environment. 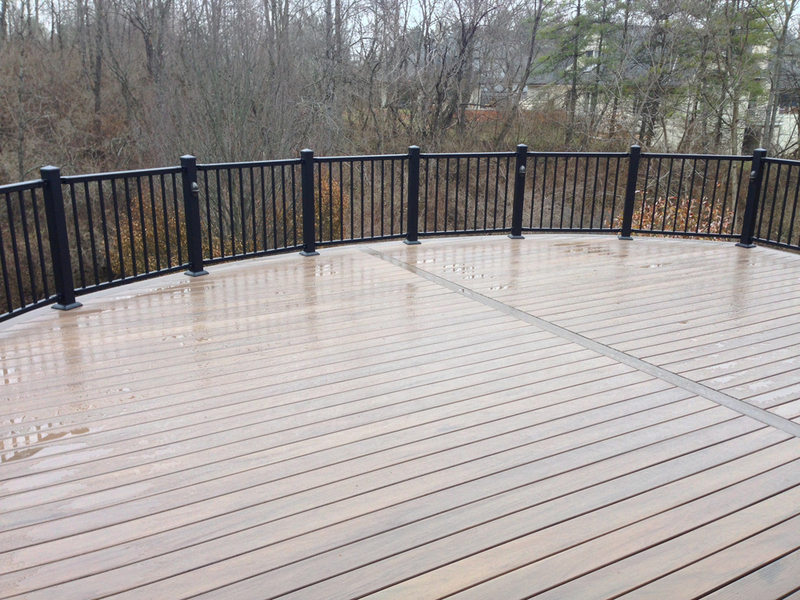 Even the wet conditions in which we took these project photos can’t hide the beauty and harmony of the picture frame decking done in TimberTech walnut and pecan. The separation of the halves within the rounded whole evoke the Yin/Yang symbol. 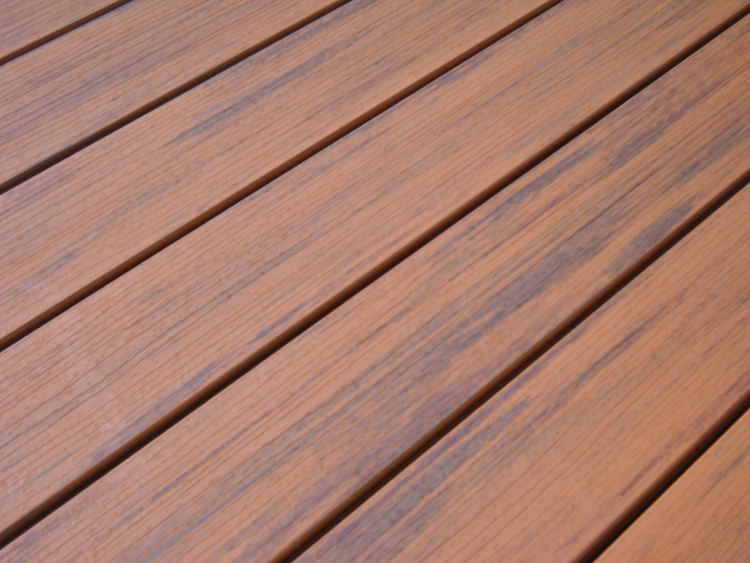 The hidden lock fasteners used to secure the decking ensure that your eye sees only uninterrupted lines. It will doubtless be even more stunning come spring when the garden and trees are in bloom. Every detail of this project was done with an eye toward beauty and utility. We remanufactured the gate to mimic the original that the owners loved. It limits access to the lower stairway for the safety of children and pets. You can barely see the dimmable post lights during the day, but in the evenings they provide plenty of light for either entertaining or relaxation. 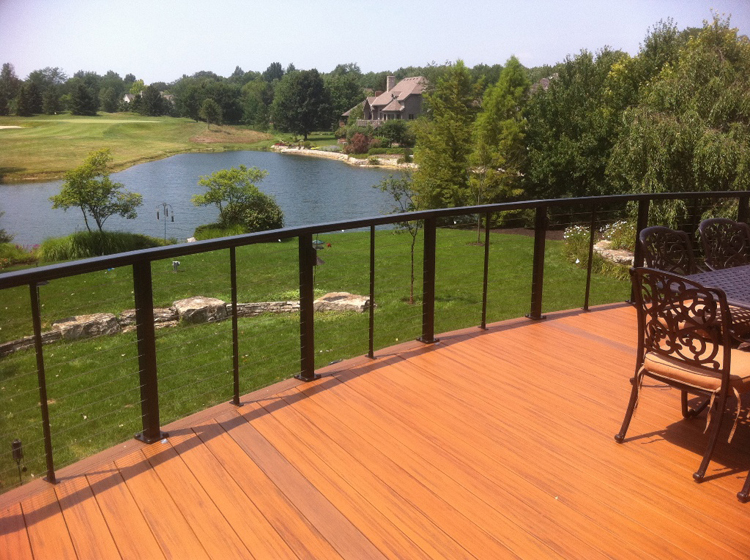 Black Pegatha aluminum rails were installed in short angles to blend with the deck curve. The icing on the cake of this project was some touch-up detailing we did on the area under the pergola and the landing of the stairway. 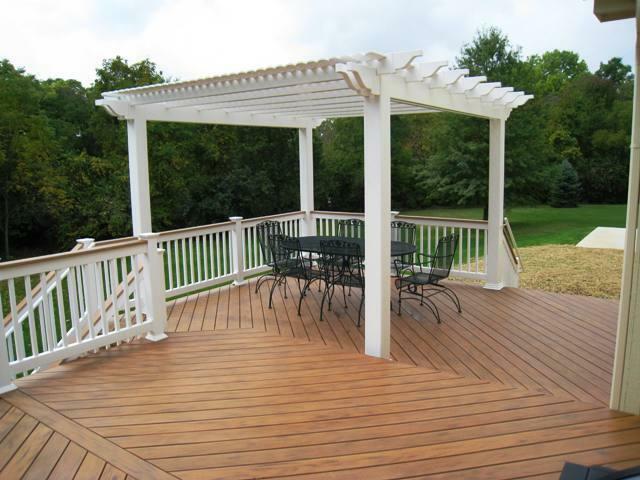 The spruced up pergola has a rubber roof to provide protection from sun and rain. The landing got a bump-out extension for a grill. The flow from home to deck to landing to yard flows like a river to the sea–it’s gorgeous. 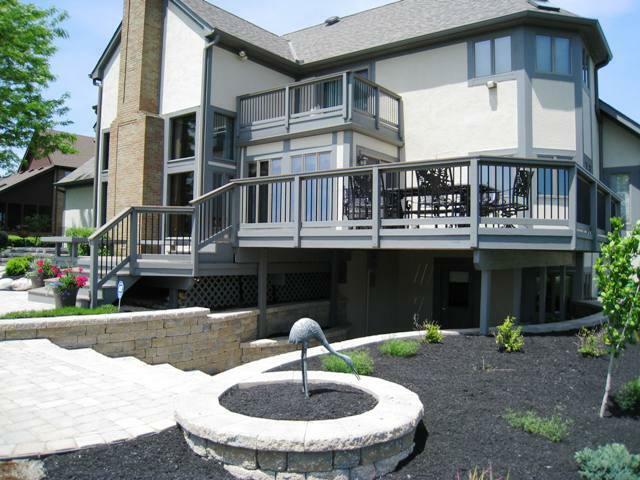 Archadeck of Columbus gives us a sneak peek into one of their curren in-progress projects which includes a stunning re-deck, expansion and hardscape addition in Columbus, OH. 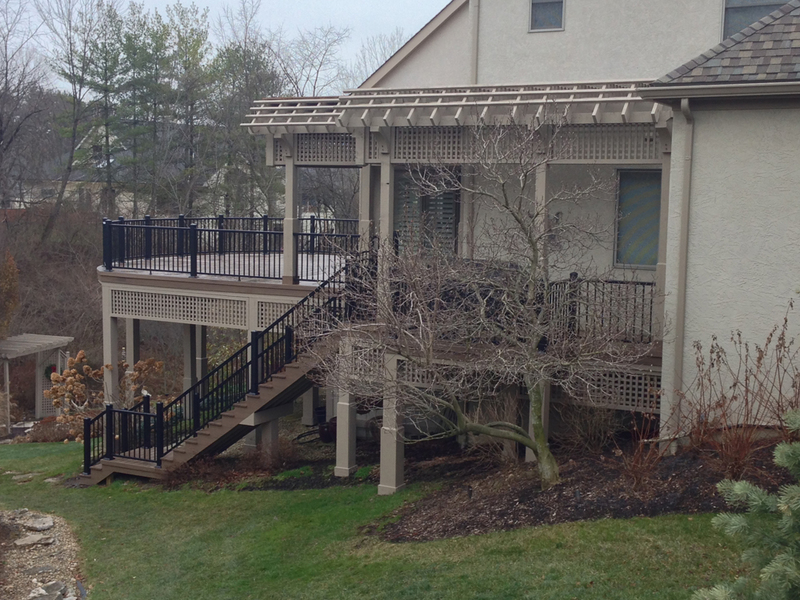 Here is a peek into this stunning re-decking , expansion and addition project in Columbus, OH we are currently working on. 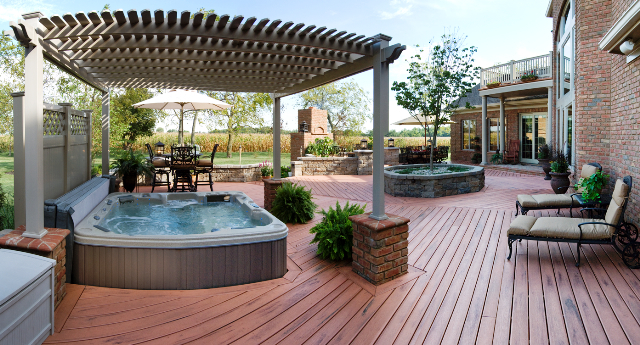 Upgrading an existing outdoor living space can take on many forms. 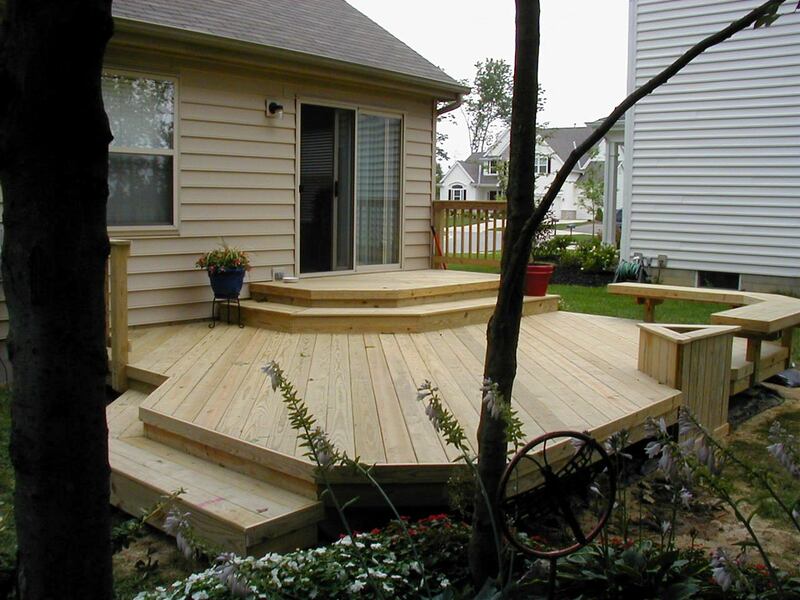 Some homeowners call us and are interested in only re-decking an existing deck while others are interested in transforming an existing deck into a porch. There are endless possibilities when it comes to upgrading and expanding upon your existing outdoor space to enhance the time you spend outdoors with your family. Our recent outdoor living area upgrade consists of a re-deck and deck extension that includes an open porch and extended hardscape area to house the homeowner’s grill and smoker. When you dig a little deeper into the details of the project, it is evident that what the homeowners are getting is so much more than additional room for grilling. When we met with these Columbus homeowners they had an existing linear rectangular deck with a permanent fabric awning that provided shade to the space. 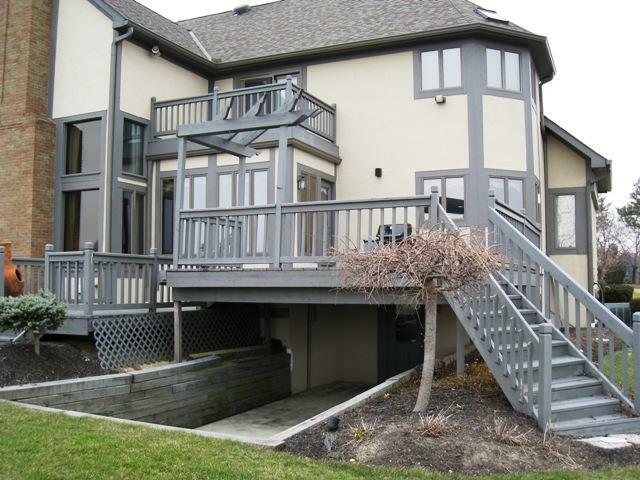 Their existing deck space did not allow for good traffic flow, or enough space with all their outdoor furnishings. 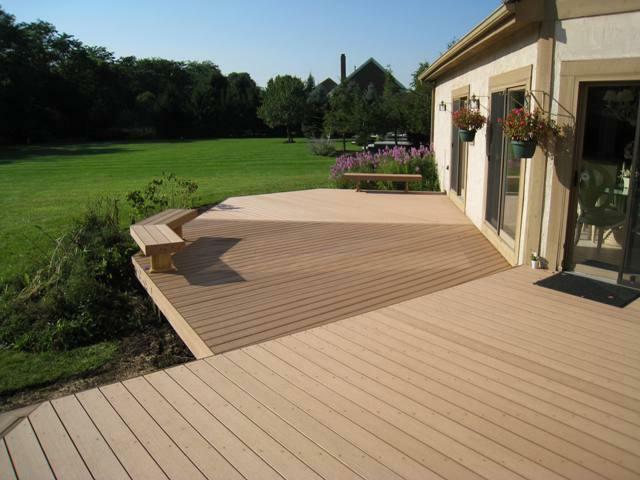 The homeowner’s goal was to expand their existing deck space out from the house on a curve to make it more aesthetically appealing. This is the detailed design rendering and custom plan prepared for this project. 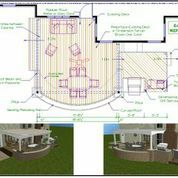 Since the existing deck is low to the ground, our design will include a hardscape seating wall that follows the same curved pattern of the deck as requested by the homeowner. 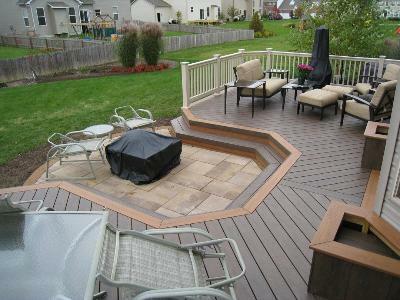 Our design encompasses re-surfacing the existing deck with TimberTech Evolutions Terrain in Brown Oak. 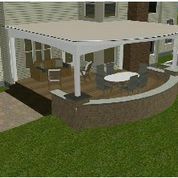 Above the deck we plan to build an open porch addition that will provide more function, shade and beauty than that of the awning previously used to gain shade. As part of the expansion, Archadeck of Columbus will also add new footings to make sure the new area is structurally sound. We are wrapping all exposed wood in Polonia for added appeal. The homeowner also asked that we minimize the columns that are to support the roof of the open porch, to accommodate this request we plan to use engineered lumber so you will only see two visible posts supporting the roof of the porch. 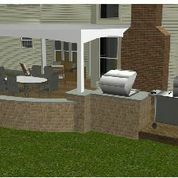 A little look at the anticipated grill and smoker area, which will lie adjacent to the deck and porch area. What is difficult about this project is the presence of second story windows right above the intended area for the porch roof. In order to overcome this obstacle Archadeck of Columbus will install a flat rubber membrane roof to facilitate the use of a low-pitched roof on the open porch. This rubber membrane roof will divert water away from the house and assist in keeping this area dry. Most rubber membranes are black, but we were able to locate one in white to fulfill another request of the homeowner. The end result will be cohesive and will match the exterior of the other amendments we are completing. On the interior porch ceiling we plan to use white ply bead as a continuation of the sleek white used elsewhere in the project. 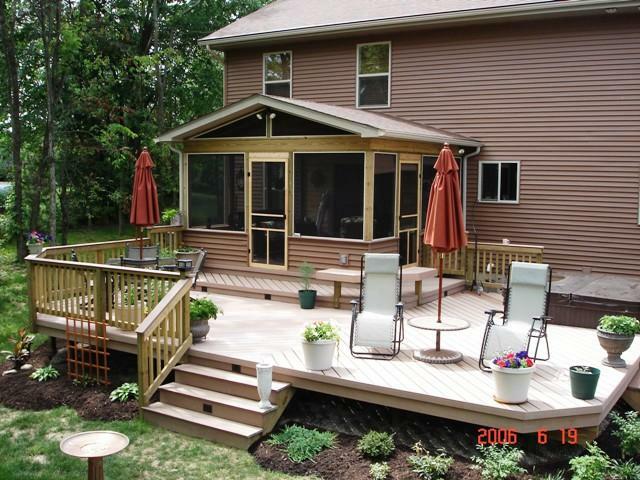 Adjacent to the deck and open porch area, we are also building a small addition for the homeowner’s grill and smoker. This portion of the project will not be under roof. A grill surround that will include taking placing vertical paver dimensions into the grill surround will add to the charm and function of this unique space. This area will function much like that of an outdoor kitchen addition. Adding to the distinct appearance of this addition is the beautiful hardscape seating wall. This area will contain small pillars against the seating wall as well as pillars above the seating wall. The finished seating wall will stand 19 inches and the post supporting the roof of the porch will come down into the seating wall. The anticipated seating wall will be wide enough to sit on and add valuable additional seating to this gorgeous backyard oasis. These Columbus homeowners are very excited about completion of this project and cannot wait to use their new and improved backyard in time for fall as the expected finish date is expected to be late summer to early fall. 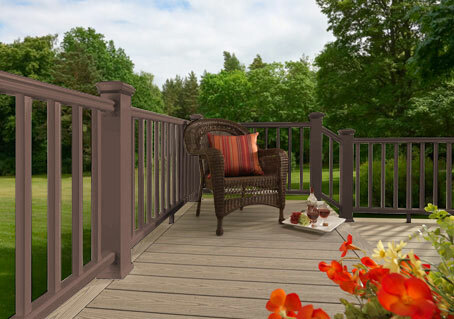 You can see more inspiring outdoor living transformations by visiting our decks photo gallery, our covered porches photo gallery and our outdoor living photo gallery located on our website.